These sites have been CONFIRMED for 2019. Location: TBA, depending on location of home. Work Site Address: This information will be provided to assigned volunteers. 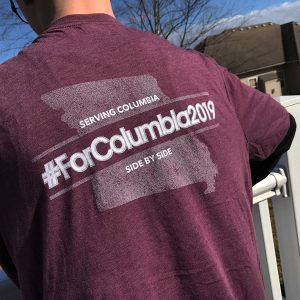 The mission of ForColumbia – to love and serve our neighbors – is most powerfully lived out when we focus on the more marginalized in our city – the chronically poor, the elderly, the disabled. This year, we have expanded our ability to accept individual referrals from a variety of sources. We have identified nearly 20 homeowners to serve in 2019 – individuals who are elderly, disabled and/or dealing with chronic health issues, who continue to live independently in their own homes but who need assistance with maintenance of their property. you might be asked to do some painting, either inside or outside. Once you are assigned to a specific site, you will get more information as to what kind(s) of work to expect. ForColumbia will provide plants, mulch, basic outdoor yard work tools and any paint or construction materials needed. If working outside, we recommend you bring any yard tools you have, trimmers for bushes, or basic construction tools. Volunteers working outside should bring work/garden gloves. If sunny, we encourage you to bring sunscreen and/or a hat. Volunteers working inside should wear clothing appropriate for painting. It depends on the home. Some sites might be great for children who can work alongside their parents, and most of these individuals would likely be delighted to visit with kids. Some projects where construction is going on may not be good for children. If in doubt, please contact [email protected] about your specific project once you have been assigned.